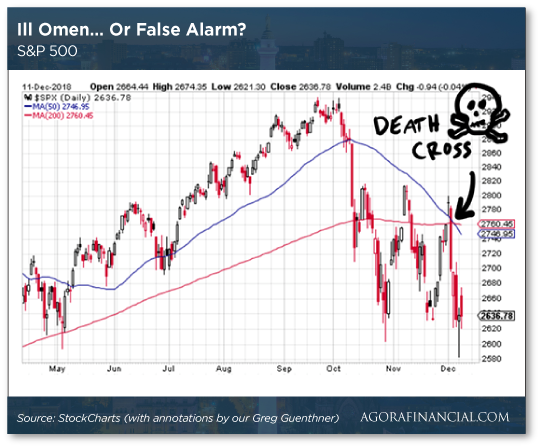 Can everyone just shut up about the “death cross” already? Small-business owners still sunny… a golden Christmas tree… a reader’s pulse on the restive French masses… and more! Here we go again with more knee-jerk reactions to trade war headlines. Oy, this is getting old. Supposedly there’s “progress” ratcheting down the U.S.-China trade war. Beijing plans to scrap its “Made in China 2025” plan to lead the way in high tech… and allow foreign companies greater access to the Middle Kingdom. For all we know, it’s true. On the other hand, we recall Knuckman’s law — proffered by Alan Knuckman, our man in the Chicago options trading pits. He says wait 48 hours before reacting to anything Donald Trump says. Under the circumstances, there’s no reason not to apply the same standard to the Chinese Communist Party. Yesterday, a Canadian court freed Meng Wanzhou on bail — on the condition she stay close to her Vancouver condo. Meng, CFO for the Chinese tech giant Huawei, was picked up in Vancouver on a U.S. warrant last weekend while changing planes. Well, this much is certain: The charges against Meng for violating U.S. sanctions on Iran are a flimsy pretext for scoring points in the trade war. But we’re not going to take the president’s words at face value. 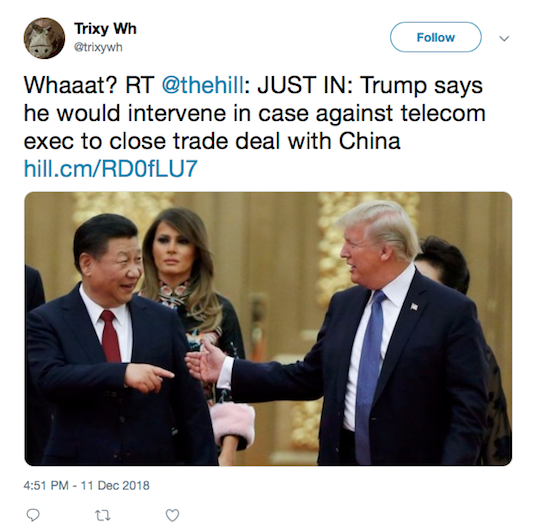 You don’t have to buy into our 30-year trade war hypothesis to know that he’s employing a negotiating tactic — with an endgame known perhaps only to himself. Meanwhile, the more we hear about the “death cross” in the S&P 500, the less we’re impressed. Alan Knuckman poured cold water on it yesterday, and now Mike Burnick is doing likewise. As a refresher, a death cross occurs when the 50-day moving average (the smooth blue line on this chart) slips below the 200-day moving average (the smooth red line). Allegedly that signals a huge move lower. It certainly did in 2000 and 2008. Bonus points: If you look at the average results from the previous 33 death crosses… the S&P is up 8.6% a year later. Seriously. Two out of three times, the index rises over the next six–12 months. We’ll file the death cross away in the same drawer with the “Hindenburg Omen” and other bogus harbingers of ruination. 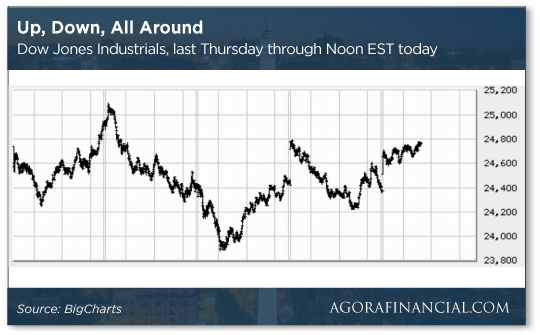 Gold is steady at $1,245, and we’re impressed at its climb these last few days despite a dollar index that’s held steady around 97. The currency markets, meanwhile, are on tenterhooks awaiting the outcome of a no-confidence vote in the British Parliament on Prime Minister Theresa May. The cost of living keeps rising — just more slowly than it has for much of this year. The Labor Department is out this morning with the November consumer price index — pancake-flat month overmonth, up 2.2% year over year. That’s the slowest pace of annual growth since January. Falling gasoline prices get a lot of the credit. If it weren’t for ever-rising housing and health care costs, the official inflation numbers would be positively tame. As always, we caution any resemblance to your own cost of living is purely coincidental. The real-world inflation rate from Shadow Government Statistics clocks in at 9.9%. But that’s also the slowest pace of growth in nearly a year. That said, slowing inflation is unlikely to deter the Federal Reserve from raising interest rates next week. As we write, trading in the fed funds futures market points to a 78% probability the Fed will raise again — for the fourth time this year. If small-business owners are worried about Democrats taking over the House of Representatives, they’re not showing it. The Small Business Optimism Index from the National Federation of Independent Business registers 104.8 for November — the lowest level in seven months but still very high by historical standards. Some of the survey responses came in before Election Day, some after. Comparing them, the NFIB says it’s a wash.
“Overall, small-business owners have shown a historic trend in optimism for their businesses and the economy and continue to be the driving force behind economic growth,” says NFIB president Juanita Duggan. Still, expectations for a stronger economy and stronger sales both dropped significantly. Meanwhile, 25% of survey respondents say their single most important problem is finding qualified help — that’s a record. On the “de-dollarization” watch, two of Washington’s key allies have agreed to ditch the dollar when trading with each other. India and the United Arab Emirates announced a currency swap agreement last week. When possible, they’ll transact in rupees and dirhams instead of dollars. How’s that for gratitude? For years, under U.S. presidents of both parties, Washington has cultivated a closer relationship with New Delhi — mostly because India is a longtime enemy of China’s and can serve as a “counterweight” to Chinese power in that part of the world. Meanwhile, the UAE is tight with the regime in Saudi Arabia and together they’re waging a genocidal war in Yemen — their warplanes getting targeting and refueling help from the United States. It’s one more development in the drip-drip-drip abandonment of the dollar as the globe’s reserve currency. You and I aren’t feeling the impact yet… but the time will come. If it feels as if the taxes on your mobile phone plan went up again this year, it’s not your imagination. The nonpartisan Tax Foundation is out with a study of wireless taxes. 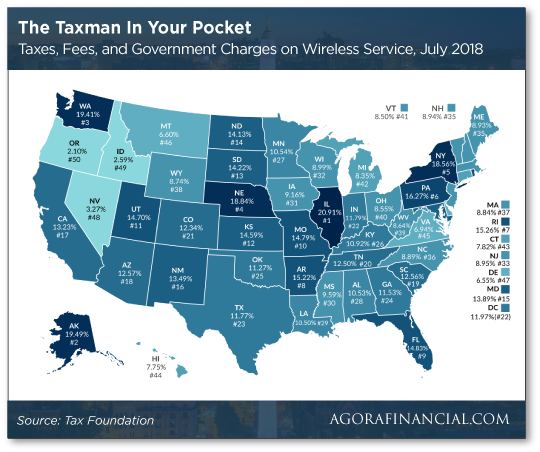 For a “typical” household shelling out $100 a month for cell service… taxes, fees and surcharges totaled $229 this year. That’s up from $221 last year. 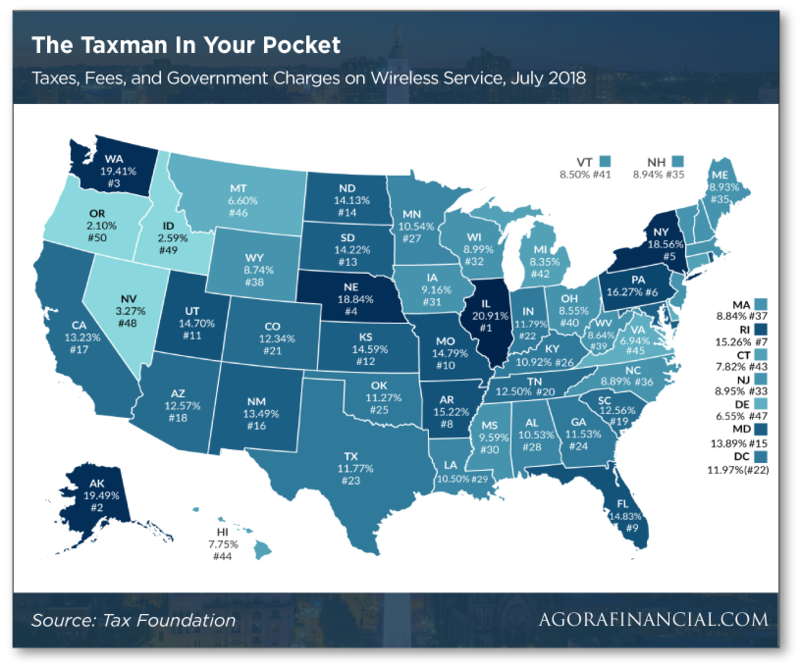 In several states, the taxes on wireless services are far higher than the sales tax on most consumer goods — more than twice as high in Nebraska, Pennsylvania, Maryland and Illinois. 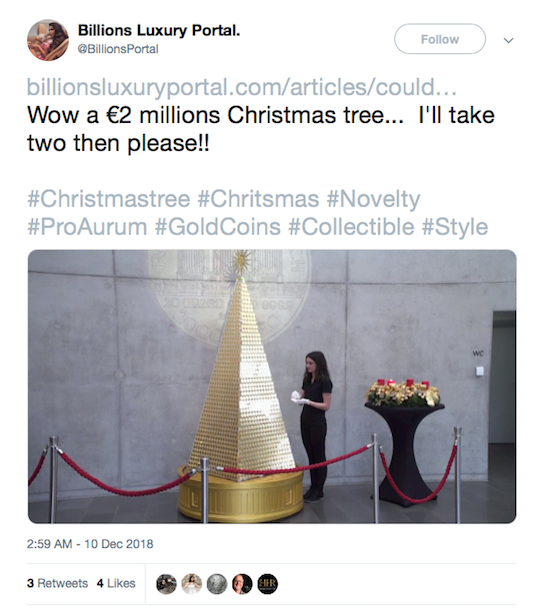 A precious metals dealer in Germany called Pro Aurum has devised a brilliant publicity stunt — assembling $2.6 million of gold coins into what’s being called the most expensive Christmas tree in Europe. Workers spent more than an hour inserting the coins into slots on a pyramid-shaped acrylic structure — in all, 2,018 1-ounce Vienna Philharmonics from the Austrian Mint. On top is a golden star with a 20-ounce Philharmonic in the center. If you want to see it in person, get a move on — it’s on display only through this Saturday at Pro Aurum’s offices in Munich. After all, that tree is made up of valuable inventory! “People in Paris are protesting against tax increases on gas and income, lower retirement payouts, mandatory vaccinations, etc. “I was in France at the beginning of July until the end of September this year, and people were saying President Macron is fining parents 2,500 euros for not vaccinating their children with 11 mandatory vaccines. “Second, ambulance drivers, truck drivers, taxi drivers and others are striking because of gas price hikes. I am afraid things will only escalate because we have not yet seen the farmers; usually, they come [into the city] with tractors. “But the violence started with the spéciale police force called the CRS (often referred to in France as the SS). “When people arrived in Paris from many parts of France to protest, the CRS tear-gassed them. When you bring in the CRS, things always end in violence as they did in 1968 — exactly 50 years ago. “The media only show a mob that’s out of control. “Now people are so upset they’re asking Macron to step down as president of France. The 5: The reader’s note came in before Macron came out of hiding Monday to announce several measures he hopes will prevent another round of protests next weekend — lifting the tax on overtime pay and easing the tax on pensions, for instance. 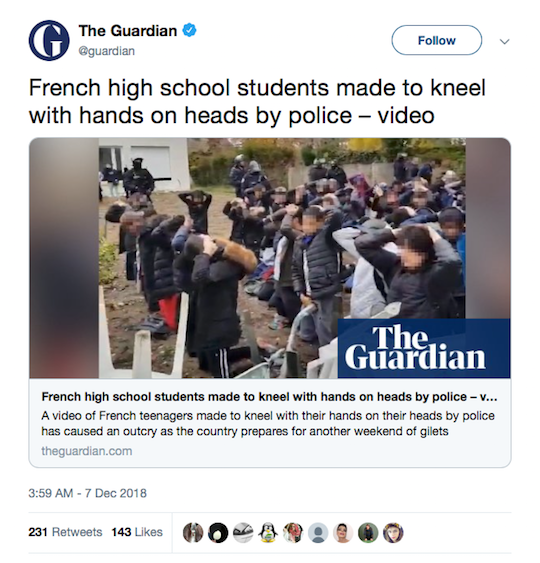 From our own distant perch, it looks as if French police are following the usual template for protests of this nature, a template going all the way back to the “Battle of Seattle” during the 1999 World Trade Organization meetings. At the risk of oversimplifying (or even sounding tinfoil-y) the template entails only token effort to stop the masked “black bloc” anarchist types from running riot, smashing windows and looting… while peaceful protesters seeking redress of their grievances get the jackboot treatment. Meanwhile, the journalist Glenn Greenwald finds parallels between the crackdown in France and the violent repression of Catalan separatists in Spain last year. In both cases, a Western democracy suppressed domestic dissent with a ferocity Westerners would find shocking if carried out by Russia or China or whomever. But it doesn’t look as if that dissent is going away. Across Europe, centrist establishment politicians have squandered their credibility… and now they’re losing their foothold. Meanwhile, Merkel in Germany is slowly on her way out after 13 years as chancellor. There too, people are fed up with the centrist parties that have dominated post-WWII politics; all the energy is with the far-right AfD and the far-left Greens. P.S. Moments ago, we went “live” with Larry King’s one-on-one exclusive featuring penny-stock sensation Tim Sykes. Tim has just revealed a new way to supercharge your retirement plans. “I’m convinced it could help solve America’s retirement crisis,” says Tim.